You Are Here: Home > Blog > Will I Lose Control Over My Employees When Working With a PEO? The co-employment relationship between an employer and a professional employer organization (PEO) like SuretyHR can often be a confusing or daunting thing. We really try to explain it in a simple way. As a PEO are certain things that we are going to share responsibility for and there are certain things that are going to be handed off to your PEO. Some employers feel that when they start working with a professional employer organization they're going to lose control over their employees and their workforce. That couldn't be further from the truth. The employer is still going to direct their employees on what to do, when to do it, they still manage their employees’ calendars, their schedules and everything else. What do PEOs help with? Just to reiterate, employers still have control over their employees and their workforce. PEOs just work as their back-office. Here at SuretyHR we like to refer to ourselves as the HR easy button. This allows employers to focus on their business while we handle all of the back-office stuff for them. What are some other advantages of working with a PEO? Not only does a PEO like SuretyHR help manage hr-busyness, there are some hard black and white savings, notably when it comes to payroll, workers' compensation and benefit related items like 401K. Working with a PEO doesn't only offer hard cost savings, but soft cost savings too. Employers should consider what they would be doing with their time if they didn't have to answer all of the HR-related questions and what is that time worth? What’s the cost of keeping employers away from a Department of Labor or some kind of adverse - employment related - lawsuit that could happen? Those are the kind of added layer benefits employers get by working with us. Outsourcing to a PEO doesn't have to be a scary thing or fear of losing control, it's really having a partner to lean on when it comes to employment related distractions. Want to learn more about the benefits of outsourcing? Click here! 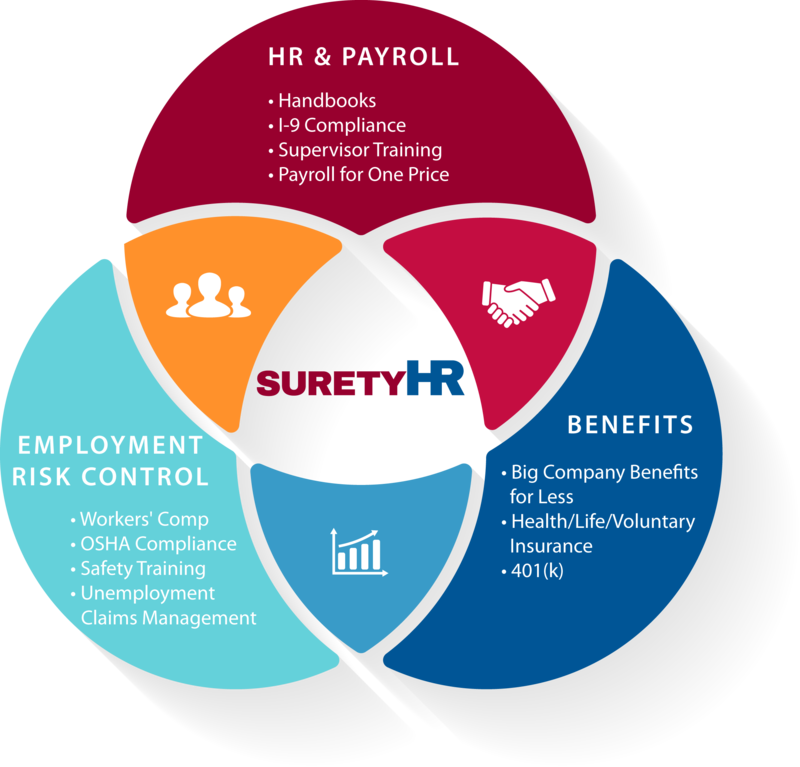 Partnering with Surety HR will not force you to lose control over your employees. As a client, your company will continue to act as the worksite employer, retain supervision of your employees and management of your business. Get Started with SuretyHR Today!